How Did Birds Lose Their Teeth And Get Their Beaks? Study Offers Clues : The Two-Way Modern birds are dinosaurs without toothy jaws, and with bigger brains. Newly published research fills in some of the missing links in their evolution. A CT-scan image of the skull of an ancient bird shows how one of the earliest bird beaks worked as a pincer, in the way beaks of modern birds do, but also had teeth left over from dinosaur ancestors. The animal, called Ichthyornis, lived around 100 million years ago in what is now North America. Modern gulls, with their large eyes, long beaks and distinctly ancient-looking and bony faces, descended from animals such as the velociraptor and T. Rex. (Next time you get a hungry look from a seagull, remember that.) For more than a century, paleontologists have used fossils from all over the world to piece together how large, toothy, land-bound lizards evolved into flying, toothless, feathered animals. The key is fossils of so-called stem birds, which are ancient birdlike dinosaurs that offer clues about the bones and brains of modern birds. 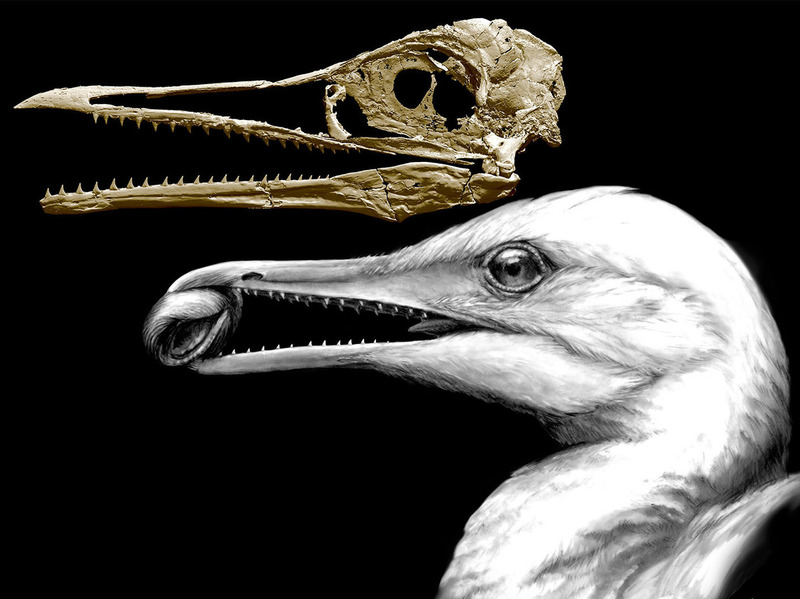 One such creature, Ichthyornis dispar, is the subject of a newly published study that fills in some of the missing links in the evolution of birds. "Ichthyornis had the aspect of a seabird, like gull or a tern," says Bhart-Anjan Bhullar, an assistant professor of geology and geophysics at Yale University. It had a long beak and large eyes, and lived in Kansas back when Kansas was an inland sea, between 100 million and 66 million years ago. But it had two things modern gulls don't: teeth and a muscular jaw to use those teeth. "It was probably flying about, picking out morsels of fish and shellfish, grabbing them with its little pincer beak and then throwing them back into its strong, dinosaurian toothed jaws — crunching them a few times and then swallowing them," Bhullar says. That combination of beak, teeth, flight and jaws make it a crucial link in bird evolution, but its skull has been difficult to study because the only fossils available were "some crushed brain cases and some lower jaws and a few other fragmentary bits," Bhullar explains. Then, in 2014, scientists working in Kansas found a complete skull fossil. Bhullar's team got a high-resolution CT scan of the fossil, which was still completely enveloped in chalky rock. In essence, the researchers did digitally what their predecessors had been forced to do manually: They extracted the bones from the surrounding stone to get a complete, three-dimensional picture of the skull. When they analyzed the images and compared them with previously discovered fossils, the researchers discovered two things. First, Ichthyornis could move its beak in a very modern way, lifting its upper beak without moving the rest of its skull, the way all birds today do. It gives the beak more dexterity, so the bird can use it to pinch very precisely. The fact that Ichthyornis could do this reinforces a theory about why birds have beaks at all: Perhaps the beak is basically a surrogate hand. However, the second finding challenges a different theory, about bird brains. "Bird-brain" insults notwithstanding, modern birds actually have relatively large brains compared with their velociraptor ancestors. "Bird brains are larger relative to their body size than is the case for reptiles, and the relative size of bird brains is comparable to that of placental mammals," paleontologist Kevin Padian of the University of California, Berkeley, says in response to the study published today in the journal Nature. "As birds evolved from their dinosaur ancestors, the bones that protect the brain enlarged to keep pace with the changes in brain size. Bhullar and others had hypothesized that as the bird skull expanded to hold a larger brain — maybe to provide more processing power for flight — the muscular jaws around the head would shrink. But Ichthyornis has both a large brain and strong jaws. "Ichthyornis fills in an important gap, but of course everything that fills a gap makes two more gaps on either side," Bhullar says. "Now we need to figure out how the remainder of the transformations toward the bird's skull occurred." Padian points out other questions the new study raises. It's still unclear what range of things ancient birds like this one used their beaks for. In addition to eating, modern birds use their beaks for everything from preening their feathers to building nests to moving their eggs. And he notes that the new information about how Ichthyornis moved its beak could offer clues to what it ate and how it gathered its food.